It did not take long for people on social media to notice the interesting way Verma found to reach his office. Later on, a video of the same was also posted online. It did not take long for people on social media to notice the interesting way Verma found to reach his office. Later on, a video of the same was posted by Sathish Sarvodaya. 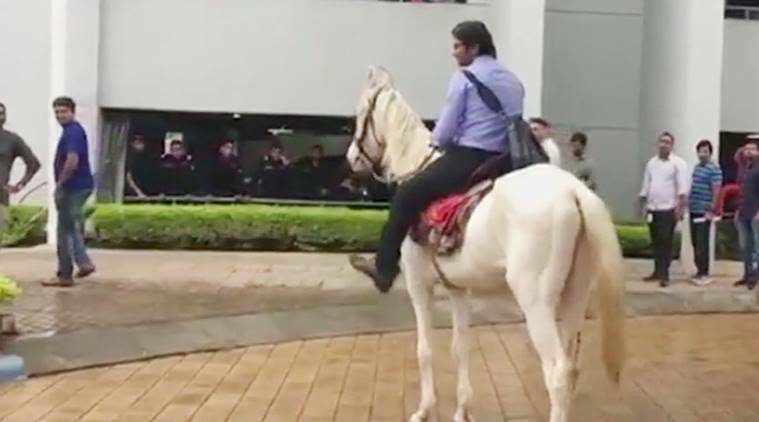 However, many people on Twitter called out the software engineer for riding the horse while claiming to be an animal lover. Thank God I am an atheist! Here, I will ride on a horse back to show that I love animals. Look at this leather belt of mine. I even love the dead animals so I kept it as a memento. Riding a horse to promote veganism? People can do anything to be in news. What do you think about this particular incident? Tell us in the comments section below. 1 AAP-LG standoff: Kejriwal’s protest stays strong on sixth day, so does the meme game! 2 Eid ul-Fitr 2018: Mumbai Police gives roses to wish people Eid Mubarak and Tweeple are loving it!